I am using both UnifiedGenotyper and HaplotypeCaller to genotype given alleles from amplicon based sequencing data. It seems that both caller did not performe well on variant rs1799752, a 50 bp insertion. Sample was verified by agarose gel method on PCR products, which was considered as gold standard for this variant. I looked into the sequences from bam files, the insertion sequence is indeed in the bam file, but can not be called by both caller. I also added -activeRegionMaxSize 1000/3000 as suggested in the forum, but it did not work as well. Can you please post IGV screenshots of the original BAM file and bamout file in the region? 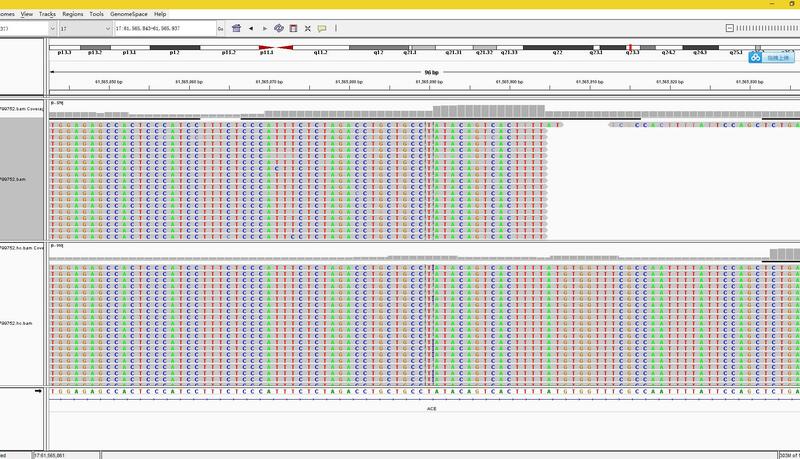 It's weird that I can not see sequences containing insert alleles, which can be observed in bam file. Plz take a look at the screenshot of the original and bamout file. I also submit the zip file as "GWI127.rs1799752.bam.tar.gz", plz take a look at your convenience. I am going to check with the team and get back to you. I am just about to put in a bug report so one of the developers has a look. It looks like something else may be going on there, because of the odd coverage in the region (perhaps a copy number event). I will let you know when the developers have had a look. We happened to run the gel to get the genotypes for this variant. Two methods have been tested these days, since I found the BadMate reads in this region. I tried to add the -rf BadMate option in command line, the variants can be called, however, 18 of 36 samples showed disconcordant genotypes. I tried to extract forward sequences with matched primer sequences only, 11 of 36 samples showed disconcordant genotypes. I found that many genotype mistakes are due to ABHet ratio. Then I did the genotype adjust, by converting 0-0.1 as hom_ref, 0.4-0.6 as Het, 0.9-1.0 as hom_alt. Although option 2 can largely increase the concordance, I am still wondering if there is any other better option that I can use GATK directly to call the variants? Are you saying that the exact indel you are looking for is called when you add -rf BadMate to your command? Did you try it with both HaplotypeCaller and UnifiedGenotyper? Yes, adding -rf BadMate can make calls, however, most of the results are disconcordant with gel results. Both HC and UG are applied to directly call the variants, which result in similar genotype callings. The only method I can find now is first extract forward sequences only and make callings. Hope there is a convenient method to directly call the variants from original bam. I am waiting for the developers to add some input. Let me see what they say.